On January 10, 1899, American Electrical Novelty and Manufacturing Company obtained U.S. Patent No. 617,592 (filed 12 March 1898) from David Misell, an inventor. This “electric device” designed by Misell was powered by “D” batteries laid front-to-back in a paper tube with the light bulb and a rough brass reflector at the end. Misell, the inventor of the tubular hand-held “electric device” (flashlight), assigned his invention over to the American Electrical Novelty and Manufacturing Company owned by Conrad Hubert. In 1905, Hubert changed the name again to The American Ever Ready Company, selling flashlights and batteries under the trademark Ever Ready. In 1906 the British Ever Ready Electrical Company was formed for export of batteries; it became independent in 1914. In 1914, The American Ever Ready Company became part of National Carbon Company. Hubert stayed on as the president. 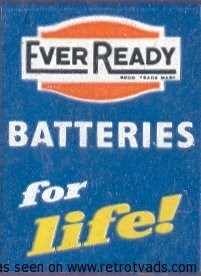 The trademark was shortened to Eveready. In 1917, National Carbon Company merged with Union Carbide to form The Union Carbide and Carbon Company. From 1917 until 1921, Eveready used the trademark “DAYLO” for their flashlights and on their batteries.